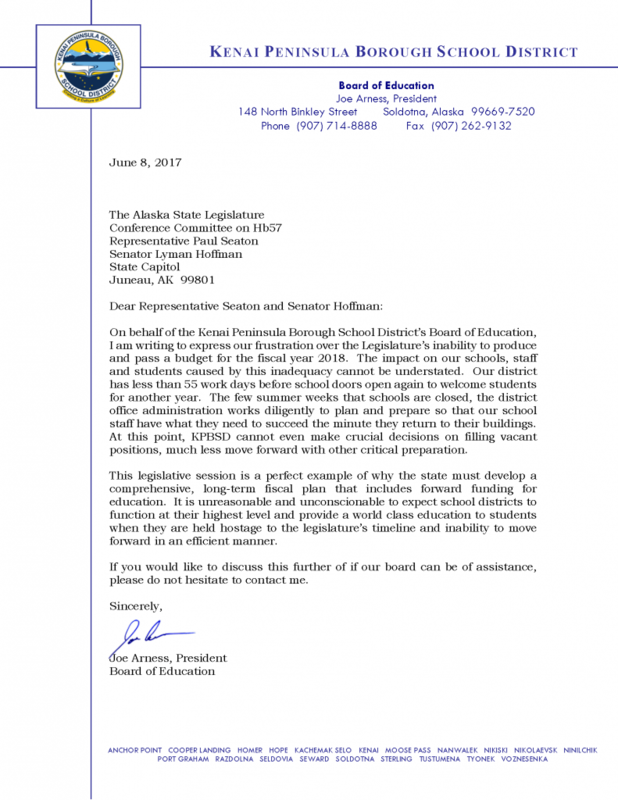 On behalf of the Kenai Peninsula Borough School District’s Board of Education, I am writing to express our frustration over the Legislature’s inability to produce and pass a budget for the fiscal year 2018. The impact on our schools, staff and students caused by this inadequacy cannot be understated. Our district has less than 55 work days before school doors open again to welcome students for another year. The few summer weeks that schools are closed, the district office administration works diligently to plan and prepare so that our school staff have what they need to succeed the minute they return to their buildings. At this point, KPBSD cannot even make crucial decisions on filling vacant positions, much less move forward with other critical preparation. This legislative session is a perfect example of why the state must develop a comprehensive, long-term fiscal plan that includes forward funding for education. It is unreasonable and unconscionable to expect school districts to function at their highest level and provide a world class education to students when they are held hostage to the legislature’s timeline and inability to move forward in an efficient manner. If you would like to discuss this further of if our board can be of assistance, please do not hesitate to contact me. This entry was posted on June 8, 2017 at 3:47 pm. You can follow any responses to this entry through the RSS 2.0 feed. You can skip to the end and leave a response. Pinging is currently not allowed.